Lasso’s monthly blog series, Email Marketing Fast Fives, explores best practices in email design, list management and deliverability in 5 easy tips per article. 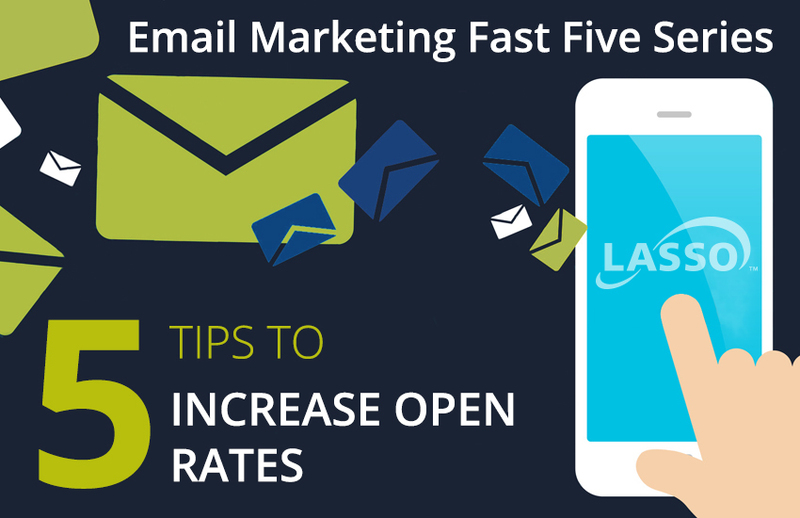 While open rate is not the only metric you should pay attention to when analyzing email campaign success, it is certainly an important one. A well-crafted, responsive email is no good if no one opens it. Below are 5 tips to get your proverbial foot in the door with your email subscribers. 1) Write engaging subject lines. Subject lines are your first line of communication with an email recipient. They should be concise, specific to the email content and urgent. Try to keep subject lines to 30 or fewer characters so they are not truncated on mobile devices. Make sure the subject line is not misleading and references exactly what the email is about. Convey a sense of urgency by using action verbs and personalizing when you can. Lastly, think of your subject line like the title of an article. Sometimes you have to create the content first, then think of the best way to summarize it. 2) Send from a person, not a company. Give your email a personal touch by sending it from… a person. Emails sent from addresses such as jon@bestbuilder.com tend to perform better than ones sent from sales@bestbuilder.com, or even worse, noreply@bestbuilder.com. If possible, use a familiar name, such as a sales agent that people may recognize. 3) Send to opted-in registrants. This tip will probably go the furthest in increasing your open rates. Send email to people who have opted in to receive it – people who actually want to receive it – and watch your open rates rise. That being said, avoid sending email to purchased lists. These recipients haven’t opted in to receive communication from you, and may not even know your company by name. They are more likely to mark the email as spam, which could hurt your sender reputation. Now that you’re sending to opted-in registrants, go a step further and segment your list according to geography, preferences or timeframe. Now include personalized messages that reference something specific or valuable to these groups. The more personal and relevant, the higher the email engagement. Figure out the best time to send email to your audience by looking at past campaigns and identifying patterns that led to higher open rates. Did you send in the morning? In the afternoon? On a Monday, or Thursday? What about Saturday morning? You can also split your groups into sections and perform A/B testing to see how the exact same email performs at different times. Bonus Tip: Send email more than once. If your recipients didn’t open the email the first time, try again! This time, send with a different subject line, or trying sending the email as a forward. Experiment with your subject line to see which one leads to a higher open rate. Use that concept for your next email. Email marketing is all about testing, analyzing and adjusting so that you reach as many recipients as possible.